Dresden, 05.10.2015. The delivery of an initial sunfire high-temperature solid oxide fuel cell (SOFC) to ThyssenKrupp Marine Systems represents the achievement of an important milestone for the Ship-Integrated Fuel Cell project (SchiBZ). ThyssenKrupp Marine Systems (as consortium leader) and sunfire have been working together on the e4ships beacon project – part of the National Innovation Programme for Hydrogen and Fuel Cell Technology (NIP) – since 2013. The aim of the project is to demonstrate the reliability of fuel cells as an on-board source of day-to-day power for ships. The aim of using SOFCs on ocean-going vessels is to reduce both fuel consumption and emissions. Stricter legislation in the maritime sector is just one reason why this is necessary. Having successfully tested the system at its headquarters in Dresden, sunfire has now supplied ThyssenKrupp Marine Systems with an initial SOFC with an electrical output of 50 KW. The electric output achieved by the prototype fuel cell can be raised to 500 kilowatts by increasing both its specific power and number of modules. The newly developed SOFC module runs on low-sulphur diesel rather than hydrogen or natural gas. As a leading SOFC manufacturer sunfire is responsible for the delivery of SOFC technology to ThyssenKrupp Marine Systems. sunfire’s SOFC technology uses a ceramic solid electrolyte to convert fuel into electric power and heat at an operating temperature of around 800 degrees Celsius. The recirculation of exhaust gases with the aid of a relatively simple, cost-efficient, integrated reforming process developed by the Aachen-based Öl-Wärme-Institut (OWI) makes it possible to achieve electrical efficiency of over 50 per cent and overall efficiency in excess of 90 per cent. The prototype installed on the MS Forester (the test ship provided by Reederei Braren) will deliver between 25 and 50 per cent of on-board power. ThyssenKrupp Marine Systems is a leading European system provider of non-nuclear submarines and high-end naval vessels. The company is a byword for marine competence, innovative technologies and comprehensive, reliable service. ThyssenKrupp Marine Systems has premises in Kiel, Hamburg and Emden, and is part of the ThyssenKrupp group’s Business Area Industrial Solutions. For further information please visit www.thyssenkrupp-marinesystems.com. 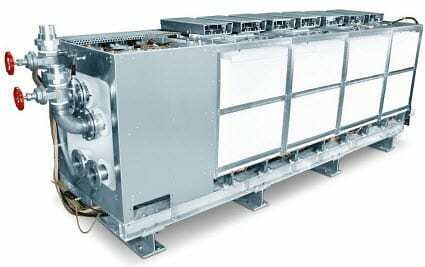 The firm’s high-temperature fuel cells facilitate the highly efficient generation of electric power and heat according to the principle of cogeneration. This sees electric power and heat generated on-demand at the point of consumption – with local cogeneration at the lower end of the output scale therefore regarded as the energy concept of the future. High-temperature electrolysis splits steam into hydrogen and oxygen. It is characterized by a particularly high level of efficiency and is powered by renewable energy. The hydrogen produced can either be efficiently converted into fuels using the sunfire Power-to-Liquids process or used without further processing in the H2 mobility or industrial sectors. sunfire was founded by Carl Berninghausen, Christian von Olshausen and Nils Aldag. The firm is supported by Business Angels, Bilfinger Venture Capital, the ERP Startfonds at KfW, TOTAL Energy Ventures, EDF Group and Allianz.